Territory Day fireworks are designed and tested to meet strict safety guidelines before they can be sold to you, however, all fireworks are hand made and some items may not perform as well as we would like. To ensure you can enjoy your fireworks safely this Territory Day, please make sure you follow the following safety guidelines, as well as all guidelines printed on the packaging or supplied with your fireworks. Make sure you have a MINIMUM of 5m from the firework to the nearest people or property (we recommend at least 10m, or 30m for children). The fireworks are designed to take up to 5m of space around themselves and may occasionally go wider than this. Communicate with each other, so you are not getting 5m from your fireworks by stepping over your friends fireworks! If your firework does not light, do not approach for 30 mins. Dispose of the firework by soaking it for a day in a bucket of water. 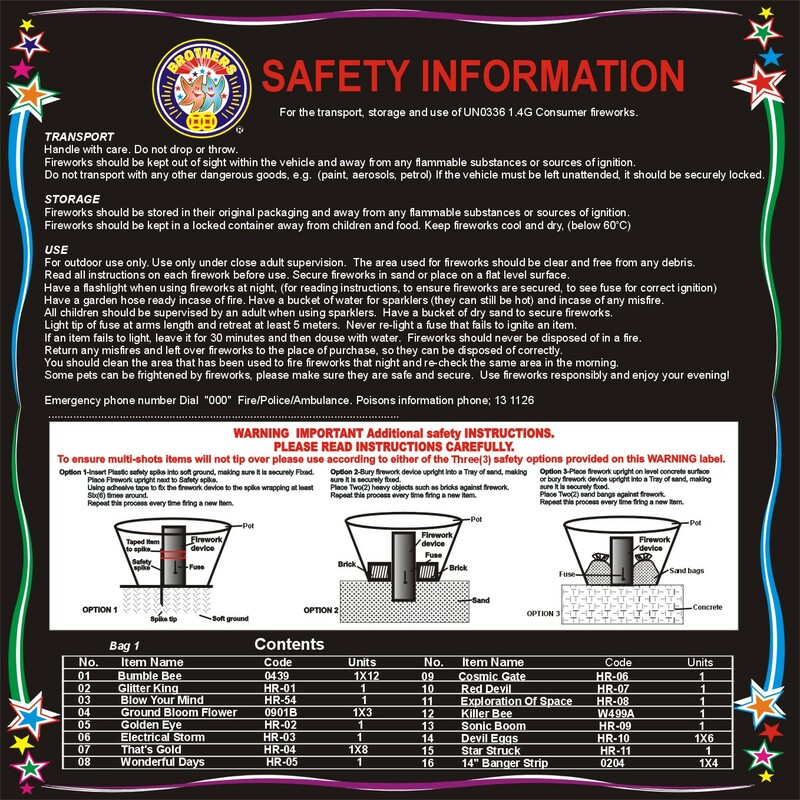 Make sure you light your flyers/planes/helicopter fireworks on a hard flat smooth surface. Tar roads, gravel, sand and grass can cause the fireworks to take off sideways. Don't buy illegal fireworks. These have not been tested and are significantly more likely to fail in a catastrophic way. Please use your fireworks safely and responsibly, so we can all enjoy them for years to come.